The WSF mission is to resolve conflict through peace-building activities that help cease conflicts impacting local communities around the world. By joining the WSF, organisations can think cooperatively and pull their resource to transform their ideas into concrete realities, to overcome obstacles that would possibly be too hard to tackle on their own and to talk to parts of society that they would otherwise not be able to reach. We’ve come a long way since the inception of the WSF with round-tables and workshops aimed at advancing human rights and socially-oriented organisations in Europe. Now we are getting ready for Summer, which will be dedicated to bigger and better events, advocacy and raising awareness about the things that matter, and we want you to have a say! 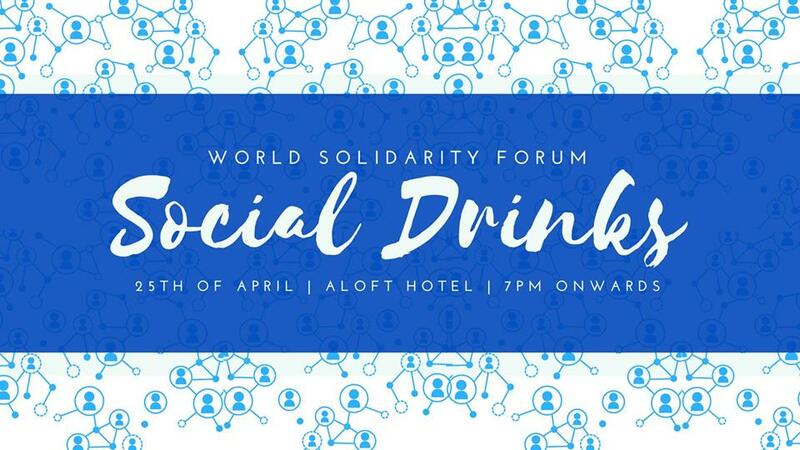 What else to expect during the WSF Social Drinks? – See exactly how can you get involved with WSF. We have a lot of openings and opportunities to collaborate with us! – Use the chance to find out about the new initiatives of the partners and/or present yours! Join us on Wednesday 25th April at 6:30 PM at the Aloft Brussels Schuman in Place Jean Rey, 1040 Brussels, Belgium. We look forward to seeing you!